Many of the species featured in Curious Creatures date back 160 million years. Curious Creatures also features artifacts and information from Robert Ripley’s worldwide explorations. For example, did you know that 1 out of every 8 Americans is from California? Don’t miss seeing the Flashlight Fish, which glow in the dark. Native to Australia, these fish have organs under their eyes that glow as a result of millions of bioluminescent bacteria. When they are glowing, they can easily attract food, as well as throw off predators. The lights also allow them to easily communicate with each other. The Flashlight Fish are enclosed in a dark room in the Curious Creatures exhibit so that you can really see them glow. The Sarcastic Fringehead is characterized by its large mouth and very aggressive behaviour. And no, it isn’t named “Sarcastic” for its dry sense of humour. Sarcastic in this case means “flesh tearing”. 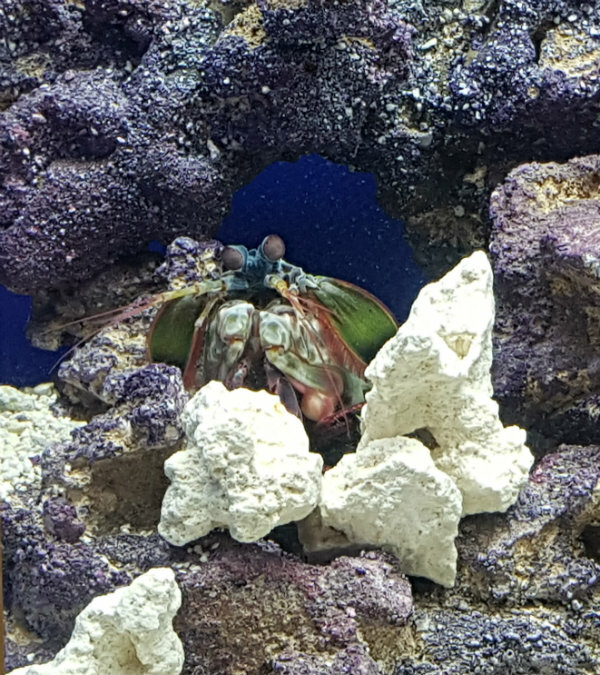 I was fascinated by the Peacock Mantis Shrimp. These colourful crustaceans are located in the Indo-Pacific Region near coral reefs and are voracious eaters. They move at the speed of a .22 caliber bullet to catch food. This guy seemed to be watching me watch it and kept itself hidden under a piece of coral until it thought I had gone. Luckily, it reappeared and I was able to get a short video, which demonstrates the way he flips his body to easily navigate the water. 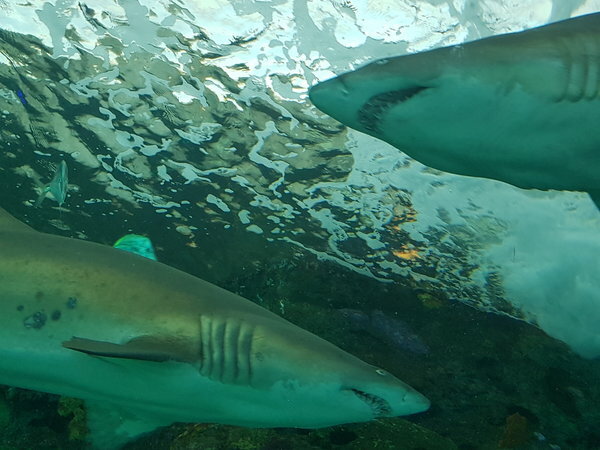 After visiting the Curious Creatures exhibit, I had to visit the Dangerous Lagoon, where sharks swim in pools while visitors walk through the glass tunnel underneath! This perspective gives you a great view of the underbelly of a shark. 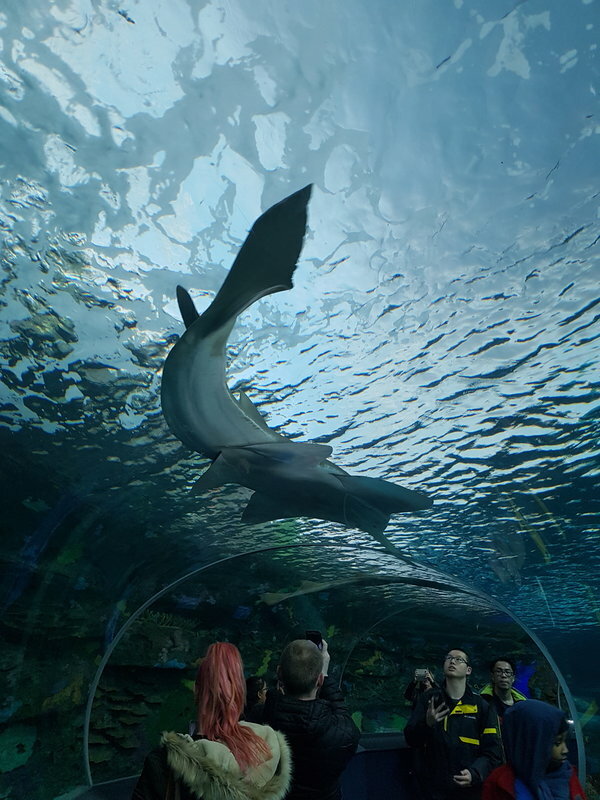 Two sharks pass each other in the Dangerous Lagoon at Ripley’s Aquarium of Canada in Toronto. Visitors watch a stingray swimming above them in the Dangerous Lagoon at Ripley’s Aquarium of Canada in Toronto. I also stopped to have a look at the gorgeous jellyfish, which became a brighter pink as they swam by. Beautiful jellyfish at Ripley’s Aquarium of Canada in Toronto. Ripley’s Aquarium of Canada is a great choice for a family visit during March Break. Ripley’s Aquarium is located at 288 Bremner Boulevard, Toronto, 647-351-3474 and is open daily from 9 a.m. to 11 p.m. Enter our giveaway to win a Family Pass to Ripley’s Aquarium of Canada in Toronto, value $118.50. Must be 19+. Yes I have and LOVE to go with my two little boys. Never ever visited Ripley’s Aquarium of Canada but would love to! I’ve been to Ripley’s once before and I loved it! Not yet, but I’d love to! Yes I have visited – we loved it. I have never been to Ripley’s Aquarium before! Looks super fun and cool! I have been to Ripley’s Aquarium, it was an amazing experience. No, I haven’t been yet. I have never been to Ripleys aquarium but I would love to go . Looks incredible . I have not but we really want to and looks like this summer in July is the time. A whole gang of us too. We went last summer and it was amazing, so many creatures that you never get to see and up close! Ripleys Aquarium is amazing, love the jellyfish wall! I have been to the aquarium twice and absolutely love it. One of my favourite places in Toronto to visit as a family. I have not visited Ripley’s Aquarium of Canada yet. 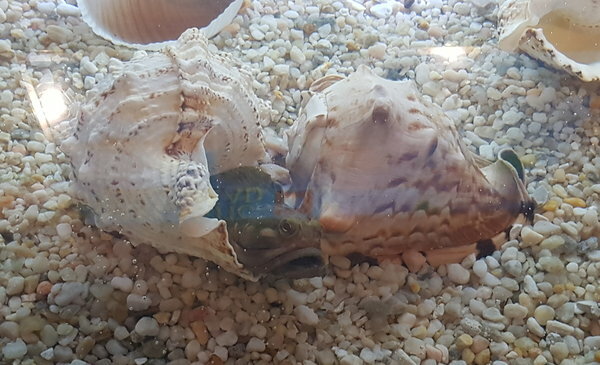 I have not visited the Aquarium yet. And if I win I cannot wait to go and take my kids. Haven’t visited yet but I’ve always wanted to! I have not yet had the privilege of visiting Ripley’s Aquarium in Toronto. Have not been but planning to really soon! 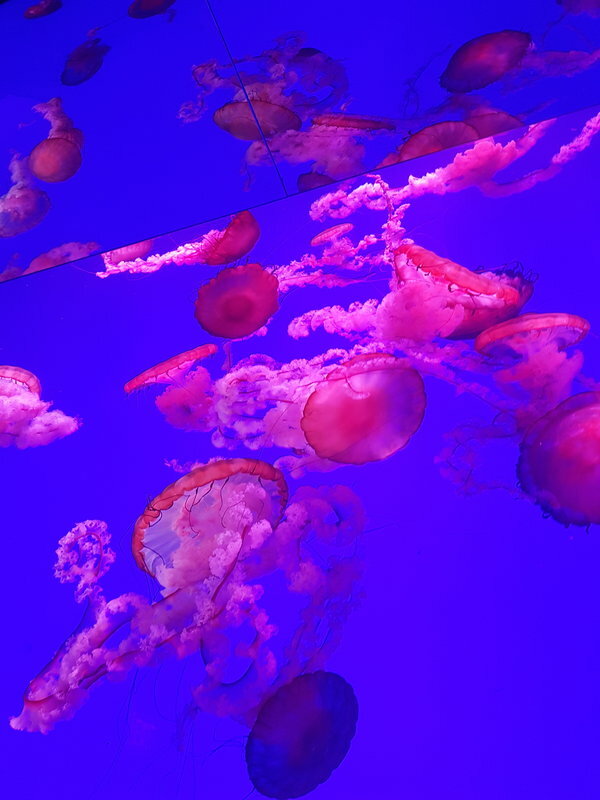 Yes, I have been to Ripley’s Aquarium….a wonderful place! Once but would LOVE to go back with my family!! Yes, I visited once when it first opened. Would love to experience it again! Yes, we’ve been there once, would love to go back! We are new to the area and haven’t had a chance to visit yet. No, I’ve never visited Ripley’s Aquarium of Canada in Toronto although it’s on my to-do list. Thanks for the chance. We keep meaning to make plans to visit but so far have not been there. I have been and I really enjoyed it. So many things to see, I’d love to go back! Yes , me and my friends had a great time in the summer! 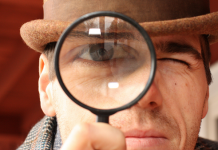 I have been once when it first opened but after reading your blog I realize that there is so much more to see. Great idea to take my granddaughters. No we haven’t. Can’t wait to go. I always have fun at the aquarium. It’s a great place to go with family and friends. So many things to do. I’ve been to the aquarium over 20 times, but with this pass I’ll be able to get others to go with me 🙂 thank you! I have been to the aquarium in Toronto. I really liked it when I went. 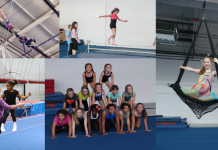 There were lots of activities to participate in and there were many great things to looks at. It’s an interesting place to learn new things and have fun. No but coming down from ottawa with my brother on the 18 to visit! Awesome looking aquarium that I have to visit soon. Yes, I visited 2 years ago. No we have never been but have heard amazing things!!! we went one would love to go again! I have never been, i have heard it is awesome – the day we had planned to go last year, my daughter got sick so I stayed home with her while the rest of the fam went, we would love the chance to go! Yes, I have visited once, many years ago and it was totally magical. I have never been to Ripleys but it looks awesome. Yes! We have been there a couple times! Always fun! We went to the sharks after dark… ir was amazing!! We loved it! I will go again and again! Yes, once about 3 years ago. We had such a great time! I have been there a few years ago when it opened. My kids and I absolutely loved it!! Yes! We have attended with an Autism group! I could spend hours visiting the jellyfish alone! No but we have always wanted to take the kids! We haven’t been yet, but would love to. I have never been there yet! Would love to win, my nephew would be thrilled! No we have not been there yet. I’ve never visited but would love to! There is so much to do at Ripley’s Aquarium and so much to look at. It’s fun for the wholef amily. I’ve been, can’t wait to visit again. we have visited before and my kids absolutely love it! Never been but I’ve heard amazing things! I would love to revisit, I feel like we may have missed a lot the first time we were there as it was so busy. Yes, and we would love to return! I’ve never gone to the Ripley’s Aquarium but would love to go with my family! We have never been to Ripley’s but should as it looks like a great place to visit and learn. We went a few years ago, but I would love to go back. Yes I’ve been to Ripley’s Aquarium, but I went shortly after it opened & would love to go back & take my kids this time! I haven’t visited yet, but my kids have and I would take them again if I won. I have never visited but will be in Toronto in May and maybe we will go there! Yes I have. We enjoyed it very much. I have not visited Ripley’s Aquarium of Canada in Toronto, can’t afford it’s very expensive to go, so this is a great opportunity. Yes and we would LOVE to return. We have never been inside but we have been outside of Ripley’s Aquarium! No I haven’t, my kids have been asking and asking to go. I have never been to Ripley’s but would really love to! We have visited Ripley’s Aquarium but it has been a few years. Yes, once but would love to go again. I have been once but would love to go back with the Grandkids! We have visited about three years ago. We would love to go again. Not yet, but I told the kiddies this summer we’d go, and go up the CN Tower. no we haven’t been there yet. Yes, I have been to the aquarium. I’d love to take my little girl for her first time soon! Yes. Have visited a couple of times. Love the tunnel. I have not visited yet. I hope to win the tickets so I can take my family. Thanks for the chance. i went once a few years ago but would love to re-visit again! it’s really spectacular! I have not been yet. It is on my list of places I want to go. I would probably take my nephews, 2 and 4. They would be amazed!